Unsuck DC Metro: Types of Rider: The "Wide Stance"
Are Metro Stations Plagued with Exit Bottlenecks? Types of Rider: The "Wide Stance"
Many of us are already familiar with another kind of "wide stance," but the practice is common on Metro, too, albeit most likely not for the same objective. Here, we see a wide stancer taking up two seats and blocking a third on an Orange Line train this morning that was crowded enough to leave people without a seat. By the time the photo was taken, he'd closed up a little bit, but at one point, the limber fellow was spread well over 90 degrees. This is inconsiderable, but my hunch is that he's simply trying to be comfortable (that is, not actively trying to be a jerk). He seems large from this angle, and if you're large it's uncomfortable as hell to put your legs together (especially if you're a guy). That said, he should at least move to the seat closer to the door, if he's going to sit at all, because then he can push up against the divider and keep his spreading (ahem) to a minimum. He looks vulgar. I am 6'1" and arthritic to boot. I have never needed to sit in such a way I look like I am desperate for a lapdance or just heavily pregnant. Wonder when's his due-date? Its hard to be a big guy on Metro (I'm 6'5", 250 lbs. myself), because both the trains and buses tend to make the seats designed for circus midgets. It IS nice to be able to be comfortable- if there's space for it. But a rush hour train isn't the time for that- close 'em up and deal with it. Re: Dan's comment...he may not be actively trying to be a jerk. But one of the biggest problems we have with civility these days (on Metro and elsewhere) is that too few people have the self-awareness to realize they ARE being a jerk. Part of being a grown-up is having self-awareness. When the bus/metro is crowded, why do people still take up a seat with their belongings? And why, when I ask them to move it, do they act like I"m inconveniencing them? No, I'm not going to stand while your bag has a seat. How about some common courtesy people? I make it a point to sit next to these folks, making them give up their space. Ok, as to the "bag people" I'm in full agreement during rush hour or any time there are few seats. But when it's not rush hour, and the train is mostly empty, and I obviously have several grocery bags plus my backpack that I'm trying to juggle, then could you consider taking another seat? So many times I've had people decided they need to sit next to me when half the train is empty when I've got tons of groceries and no place to put them. I've actually had to give up trying to balance them on my lap and the floor beneath me, make the person get up so I can move to another seat because I simply can't find room for everything, which kind of defeats your point. I purposefully don't do my shopping until well after rush hour so I don't inconvenience other folks, but you, anonymous @7:54pm, who likes to force people to give up space when there is other space available, that's kind of jerky too. anon @ 8:48: I find that a good way to deal with the jerky people who want to make you move your bags just so they can sit next to you is, when they ask you to move your bags so they can sit down, stand up, offer them the inside seat next to the window, then sit back down on the aisle, so you can keep your bags in the aisle. If they balk at this, explain that perhaps they didn't notice that you have several parcels, and in fact you don't have room to hold everything on your lap, so you will be needing the aisle, unless they want to hold your bags for you. Alternatively, if you get the vibe that the person seems more interested in sitting next to YOU than in making a point about a bags (the pervy, rather than jerky, rider), then just get up and move to another seat at the outset. "I'm afraid there isn't room for both of us here, but if you really want THIS seat, ok," is a good line if they seem put out by this. umm ... perhaps you did not notice that the previous poster was saying ppl putting parcels on seats are the jerks? 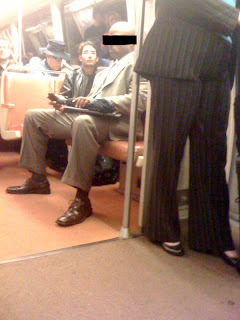 FYI - I think you will find that a LOT of metro riders agree with 9:35's attitude towards seat hoggers. Kara - I think you didn't notice that there were two different issues being discussed. Seat hoggers are bad people, yes, whether its with a bag or with their legs spread or whatever - when the train is crowded. When it is not, however, there is no reason to force somebody to put their bags on their lap simply to prove a point. Ie, at 9:30 on a thursday night on the green line, if I want to put my groceries next to me on the seat, please - just take any one of the numerous empty seats rather than forcing me to move my things just to prove a point. That's one kind of jerky person, the person who is proving a point or a pervert or just annoying in this situation. However, during rush hour or any other time the train is crowded - absolutely, bags shouldn't be taking up seats and those folks who refuse to move them are jerks. Why is everyone scared to speak up, and ask them to move over, move your bag, whatever it takes. I say excuse me then "squeeze" in taking alittle of "their" space.